Lincolnshire filled bedding supplier Fogarty has agreed new banking facilities including asset based finance and a term loan. The finance, finalised with Close Invoice Finance in August and outlined in accounts filed last week for 2013–14, includes a three-year loan and an asset based facility for a minimum 12 months. Details of the amounts involved were not included. Fogarty had narrowed its net debt to £6.6m at the end of September 2014 (2013: £7.3m). 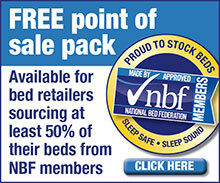 Fogarty supplies its pillows and duvets to major retailers including Argos, Dunelm and Amazon. It saw underlying EBITDA halve to £732,000 last year as revenue declined 5.9 per cent to £33.2m. It recorded a statutory pre-tax loss of £520,000, having made £502,000 in 2012–13.